I’m so proud of my team right now for coming out and showing Omaha Heat what we are made of! 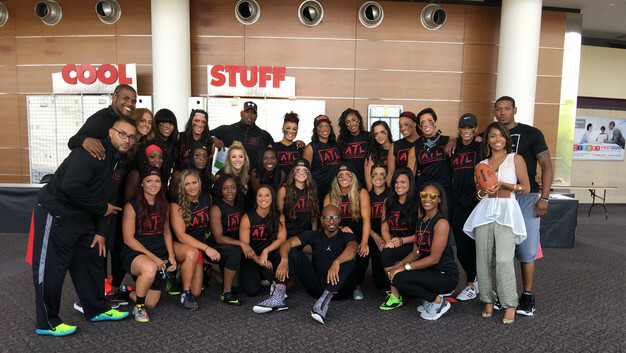 We just played our first season opener game for the Atlanta Steam and tore that field up! We killed the game with a final score of 77-0 against Omaha!!! That score was definetly a reflection of all the hard work and preparation we put in leading up to that moment. For me, the week leading up to the game was crucial. I knew this was time to lay off heavy lifts and just focus of being crisp and FAST. I worked on running back drills and some speed work on the track. Before the game the goal is get in quality reps in order for your body to feel fresh and ready to perform on the field. The day before the game I always get in a light warm up to increase blood flow and get in some stretching. On game day we arrive at the stadium fresh and ready to play. Once hair and makeup is done we had an opportunity to sit together as a team and have a motivational speaker address our team. His words really spoke to me. He spoke about how far women have come just by pushing limits and making a difference in the world. Our team is about making a change. Proving that not just men can play football, women can too. He spoke about this being our time to shine and show the world what we are made of. I honestly felt inspired by his message and was ready to ball out that day. Following that we went into a team warm up and light run though just going over plays for the game. Just being in that moment and seeing the confidence in my teammates I knew this was going to be a great day for football. After that we had a chance to just relax and focus for the game coming up. I have some pre game rituals. I make sure I have a game play playlist ready to go and when I put in my headphones I block out the rest of the world and just focus. At this point nothing can distract me. I then walk out to the field and have a seat in the stands. I envision myself running through our plays and I see my team and I being successful. I have been doing visualization training such as this in the off season during my injuring phase. I believe this helped me get back on track helping me see the light at the end of the tunnel. Positive thoughts turn into positive actions. After this I go back in the locker room and get my gear ready for warm ups. At 7PM both teams get a chance to get out on the field for a final warm up in front of the crowd. I love this part! We get to start seeing the crowd get excited about the game. After warm ups its pads on and its GAME TIME. At 8PM we head back out on the field for war. As I hold my hand on my heart and hear the American anthem I look up at the flag and just take in the moment realizing the opportunity I have today to do something great. Now my nerves are high and I’m ready for the game. After the game we get to walk upstairs as a team at our home field and sign autographs for fans! This part of the day makes me feel truly blessed. I got to meet a little girl who was inspired by us and wanted to play football when she got older. THIS IS WHY I PLAY! One of goals is to inspire women and girls everywhere to push their limits, not be afraid to lift weights, and be inspired to play any sport a man can. Being STRONG IS BEAUTIFUL. I want to thank my team for inspiring me to be the best athlete I know how to be. This was key in helping me reach the nZone 3 times!!! Gearing up for our next game July 9th in ATL. Thanks for everyone's support that came out and hope to see you at our next game! 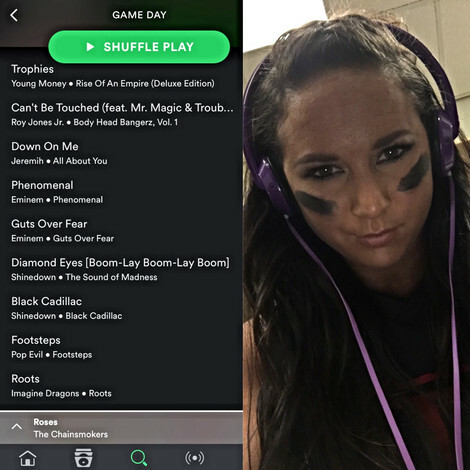 Check out my Game Day Playlist! Is there a song I'm missing from the list? Let me know your game day pump up songs so I'm ready for July 9th!! !